Capacity to roll and camber small or large beams, angles, and tubes. Steel is an optimal material to use in a wide variety of construction projects because of its strength, durability, versatility, and affordability. Of the many ways you can fabricate steel, a steel plate is one of the most commonly used forms for structural and construction applications. 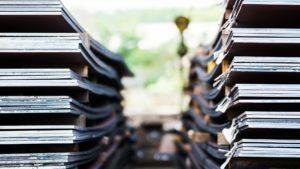 One of the main benefits of steel plates is that you can create your own versions of materials depending on the length, strength, and shape you desire. In addition to its flexibility, the construction of the product is a speedy process compared to other reinforced concrete construction processes. Steel plates and steel sheets are adaptable and easy to work with, which means both materials can be modified to meet your building requirements. Steel can also be combined with other metals to create alloys. The mixed metals result in a corrosion resistant material and can be adjusted depending on how strong or light you need it to be. For example, a steel plate typically has a thickness of six millimeters or greater, while a steel sheet is thinner than six millimeters. The main difference between a plate and sheet is the gauge or thickness of the metal. Both can have varying durability and weight. Ultimately, those characteristics depend on the application needs. Steel plates are more commonly utilized in projects where durability is more important than weight. On the contrary, steel sheets are predominantly used in structures that require strength without increasing weight. Steel plates are created by rolling steel in extremely hot temperatures, typically at a temperature of 1,700 degrees or hotter, until achieving the desired strength and thickness. Once the sheet of metal cools down, it hardens into the final product: a steel plate. From here, the steel plate is cut down to size based on the construction project. Steel Specialties, Inc. in El Paso offers a large selection of steel plates. Depending on the size and thickness you’re needing, we can accommodate your needs. Steel can be fabricated to best match the correct steel for the job, such as thickness and strength. At Steel Specialties, Inc. all products are purchased at the standard sizes of 20, 40, and 60 feet, as well as shorter remnant sizes. Our facility is capable of rolling and cambering beams, angle, and tubes and we will do our best to meet your needs. If you’re in need of steel plates for your next big project in El Paso or the surrounding area, contact us today at 915-590-2337. You can also email us questions regarding material at sales@steelspecialtiesinc.net. We look forward to serving you.